This gift box is specially made for the constellation of Pisces (February 19 – March 20) and contains 5 small variations of different products that are custom made for this constellation. The stones and scents around which these products are made are: Amethyst quartz, Fluorite & Rainbow Moonstone, and Jasmine, Sandalwood and Apple. A fun, personal gift for someone who has their birthday in this period or is new with gems and spirituality! Pisces, you are: sensitive, compassionate, kind, intuitive, sympathetic and imaginative. The stones in the products are meant to strengthen your positive qualities. 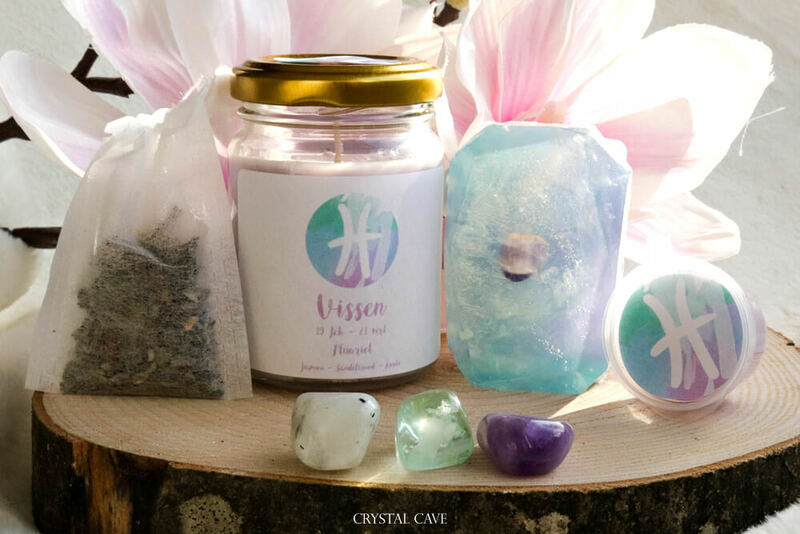 These products can be useful in meditations, carry them with you to remind you of your daily intentions, as decoration or if you just love the constellations! Amethyst quartz is a combination of amethyst and white quartz. The quartz in amethyst quartz enhances the effect of amethyst. Amethyst works well against different types of headaches and sleep problems. Put a stone under your pillow to improve sleep quality. Amethyst also works well against stress and nervousness. The stone helps you to let go of negative thoughts and to process traumas. Amethyst promotes mental clarity, gives protection and ensures purification. It helps to see situations without judgment and shows you life with compassion. Fluorite gives peace, focus and positivity. It is a protective and stabilizing stone that increases self-confidence. It would be a great gift for a person who is a student because it is also a great learning tool. 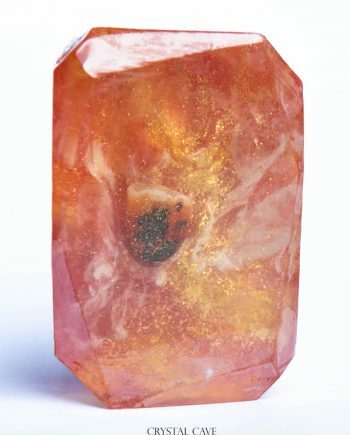 The stone promotes concentration, ensures fast information processing and helps to make connections with existing knowledge. Fluorite provides insight into limiting behavior and thinking and works emotionally stabilizing. Fluorite cleans the aura of those who keep or carry it around. It is said to neutralize and absorb stress and negative energies and block excess energies. The stone has a beneficial effect on the skin. Fluorite improves decisiveness, concentration and self-confidence. In addition, this crystal can stimulate physical and mental coordination, generate positivity and bring its own energies into balance. Moonstone is associated with the moon and is a useful stone for women. It helps to connect with all the different cycles we experience in life. Many people find moonstone very soothing and use it to relieve stress. Also known as white labradorite, rainbow moonstone connects us with Divine Inspiration and binds it in our own intuition. Working with the stone encourages introspection and judgment, making decision-making easier. Rainbow moonstone helps us with a smoother transition to meditation. It calms the mind of the babble that can influence our meditative state. This allows us to be in the here and now without distraction. The stone opens the crown chakra and brings in loving healing energies that will flow through our being. – Contains 3 stones: Amethyst, Fluorite and Moonstone which are in a hand-stamped suede pouch + card with features of the stones. Each stone will vary in size, shape, color and pattern. No parabens – vegetable soap – high glycerin content which feels nice on the skin. Vegan, animal cruelty-free and does not contain palm oil. This soap contains one Amethyst quartz gemstone. Ingredients (INCI): Glycerin, Aqua, Sodium Stearate, Sorbitol, Propylene Glycol, Sodium Laurate, Sodium Laureth Sulfate, Sodium Chloride, Sodium Lauryl Sulfate, Parfum, Stearic Acid, Lauric Acid, Pentasodium Penetate, Tetrasodium Etidronate, Titanium Dioxide, Hexyl Cinnamal, Hydroxycitronellal, CI 77019, CI 77288, CI 77492, CI 77742, CI 77891. All our soaps are handmade and differ slightly in terms of weight, take into account when ordering that the end result can look different than on the pictures. Our soaps have the necessary safety reports, comply with the 1223/2009 European cosmetic regulations, are made under GMP and registered with the CPNP.